Known as Chogogo in Papiamentu, the Caribbean Flamingo (Phoenicopterus ruber) is Bonaire’s national bird. You can regularly see flamingos foraging in Bonaire’s saliñas (salt marshes), it’s hard to miss their distinctive pink plumage, long legs, and honking calls. They flock to Bonaire by the thousands to feed on brine shrimp and algae- a diet rich in carotene that gives them their characteristic pink coloration. You may notice how they sway their curved beak over the surface of the marsh to filter feed. 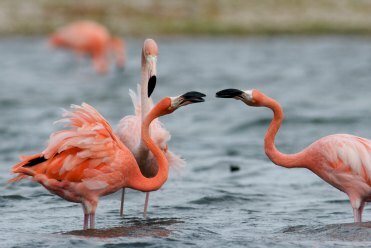 Bonaire is one of four major flamingo breeding sites in the Caribbean. On Bonaire, the flamingos breed exclusively in the Pekelmeer flamingo sanctuary in the south of the island, typically from January to July. 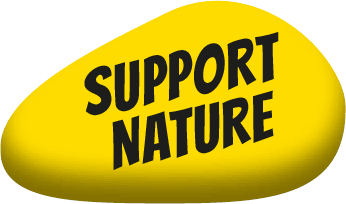 The solar salt company Cargill manages the flamingo sanctuary, adjusting the water level within the sanctuary to ensure that it is optimal for breeding flamingos and making sure they are not disturbed. Upwards of 3,000 pairs of flamingos breed the sanctuary every year. The females lay a single white egg in a volcano-shaped nest built from mud. Once the breeding season is over, a portion of the colony flies to mainland Venezuela to feed in lagoons along the coast. 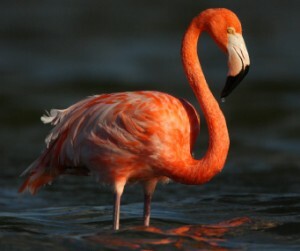 For detailed information on Flamingos click here.